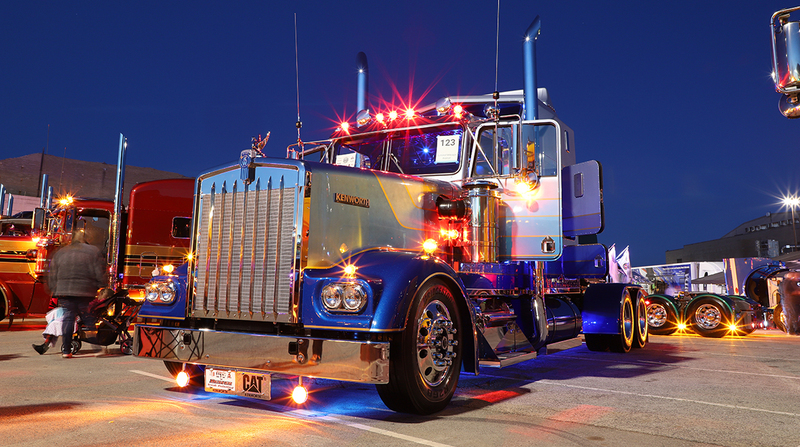 While there is no overall winner in the “beauty contest” for trucks, there were plenty of truck owners claiming a top award at the Kentucky Expo Center. Kaleb Hammet of Dodd City, Texas, working bobtail, 2017 Peterbilt 389. Truck name and color: “Ya-Savvy,” red and gray. Eric Turner Sr. of Ellenwood, Ga., working combo, 2015 Peterbilt 389 and 2018 Wally-Mo eight-car hauler. Truck name and color: “Show Time,” blue. K.C. Cousins of Carthage, Mo., limited mileage bobtail with limited miles, 2017 Kenworth W900L. Truck name and color: “Citrus Mistress,” orange. Durrell M. Martin of New Holland, Pa., limited mileage bobtail with no miles, 2013 Peterbilt 389. Truck name and color: “Big Red,” red. Dustin Shipman of Sparta, Mo., limited mileage combo, 2008 Kenworth W900L and 2019 Entyre/Low Boy. Truck name and color: “Never Satisfied,” red. Brian Parsons of Johnstown, Ohio, working dump, 2019 International HX. Truck name and color: none, black and purple. Elliott Newberry of Vansant, Va., limited mileage dump, 2018 Peterbilt 389. Truck name and color: “White Lightnin’, ” white. Jonathan Eilen won best of show in a non-working dump, throwing himself into refurbishing the truck, a 2007 Peterbilt 379 EXHD with a 2019 Mac/Half-Round, a week before Christmas 2018. It’s named “Final-Final” and is black. Eilen said his brother, Jake Eilen, passed away without winning the top award. And he did. The award was given in Jake Eilen’s name.